SOUTH WHITLEY, IN. – When a coach has a team that does not want to be denied, it helps swing momentum quickly. Class 2A #7 LaVille led by double-digits into the third quarter before host Whitko rallied to take a 42-41 lead. The Lancers, however, rallied to start the fourth quarter by hitting three 3-point field goals en route to a 62-50 non-conference victory. Seniors Luke Beehler and Jared Beehler hit long-range jumpers to turn a 42-41 deficit into a 50-42 lead. “We were able to turn a one-point deficit in to 11-point run on our end,” said Edison. “We were down 42-41 and then ended up going up 52 – 42. Some good shot selection and some defensive stops were the keys. 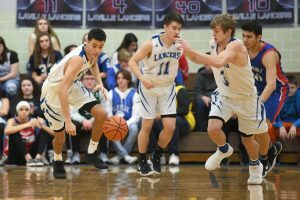 Up 10 and the clock ticking away, LaVille went to its patient offense, forced Whitko to foul and, for the second straight night, converted at the free throw line. The Lancers went 10-for-10 in the final period to secure the 16th victory of the season. During Whitko’s 21-11 third-quarter run, it was the Wildcat big man that sparked a momentum change. 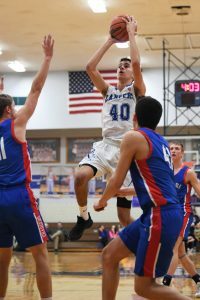 Luke Beehler and Rilye Cox led LaVille’s offense with 24 points each. Jared Beehler added nine points, including a pair of early 3-pointers. LaVille improves to 16-3 overall and heads into a doubleheader weekend. The Lancers travel to Hoosier North Athletic Conference foe Caston (3-13) February 15. LHS then plays hits the road February 16 for a make-up date with South Bend St. Joseph (8-8).